My labmate Tim sent me an email on Wednesday (April 15th) saying that Amy Goodman "Democracy Now! fame, and my heroin" [sic] was speaking on campus at noon. The place was packed, and it's the best way I could have imagined to snap back out of the Qualifying Exam bubble I've spent the last several months in, and re-engage with the world at large. 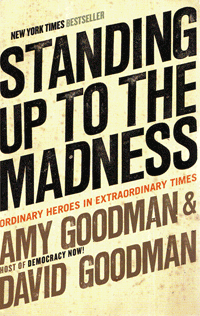 One of the excuses for the tour is the paperback release of Standing up to the Madness: _ Ordinary Heroes in Extraordinary Times_ by Amy and David Goodman. Now that I'm a tenured grad student, I can actually allow myself to read for pleasure - guilt free! So I went to the library that Thursday, and picked up the hardcover, which came out last year. What I liked about this book is what sets it apart from other political books of today. Amy and David don't just provide us with a laundry list of wrongdoing by the Bush administration, congress, various governmental agencies, as well as highlighting some of the ongoing local struggles. Though the book is chock-full of such details, they are all provided in the context of a particular vignette. What's more - instead of simply stating the problems, or providing an outline of the authors' opinions regarding what course of action should be taken, the book highlights the work average citizens have already done to oppose injustice, censorship, racism, etc. One example is T-shirt "terrorist" Raed Jarrar, who wore a shirt with the words "We will not be silent" - written in both English and Arabic - a reference to the White Rose - and was forced to put another shirt over it because JetBlue customers were threatened or offended. With the help of the ACLU, Jarrar sued the TSA and JetBlue, who ended up paying $240,000 to settle the discrimination charges. Like Hochschild's King Leopold's Ghost ((which, after I first read it in 2001 became my measuring stick for gauging the quality of non-fiction)), this book is non-fiction that reads like fiction. Not because it is well-written, though it is, but because of the shocking realities of the content. Leadership cannot be taught, it can only be revealed. Standing up to the Madness gives us dozens of snapshots of the ongoing work of ordinary heroes.